LONDON — Sept. 7, 2017 — Autoscript, the world’s leading teleprompting company and a Vitec Group brand, today announced that its all-new Intelligent Prompting solution has received China’s coveted BIRTV Award in the Outstanding Product category. The award specifically recognizes the solution’s WinPlus-IP, an updated version of Autoscript’s WinPlus teleprompting software that includes powerful new functionality and key features enhancing ease of use. Intelligent Prompting is the broadcast industry’s first completely IP-enabled teleprompting solution, delivering the connectivity, flexibility, ease of use, and reliability critical for the modern broadcast operations of today and tomorrow. Launched at the 2017 NAB Show in April, Intelligent Prompting was just introduced to the Asia-Pacific market at the 2017 Beijing International Radio, TV and Film Exhibition (BIRTV) in Beijing, where it was presented with the BIRTV award. Intelligent Prompting’s IP-enabled prompting workflow creates endless opportunities for broadcast operations to collaborate across geographies and provide cost-effective resource allocation. One operator can control the script in multiple locations and instantly switch control to another operator anywhere in the world when necessary. Likewise, IP connectivity provides powerful redundancy, since a second master software application can be installed and then take over control seamlessly as required. Intelligent Prompting is driven by the WinPlus-IP software, which builds on existing procedures in WinPlus, such as shortcut keys and layouts, while including improvements to the software’s ease of use, such as clearer menu structures and added functionality. The software’s modern user interface includes a device-status tool to enable monitoring and management of all Intelligent Prompting devices on the network. These new features ensure that broadcasters avoid the downtime and errors associated with learning a new system and benefit from simple, centralised management of all devices. Presented every year at the BIRTV Exhibition, these awards are the most prestigious in the Chinese broadcast industry. Prizes are awarded to the most innovative products, the most anticipated products, and products with the most practical applications. 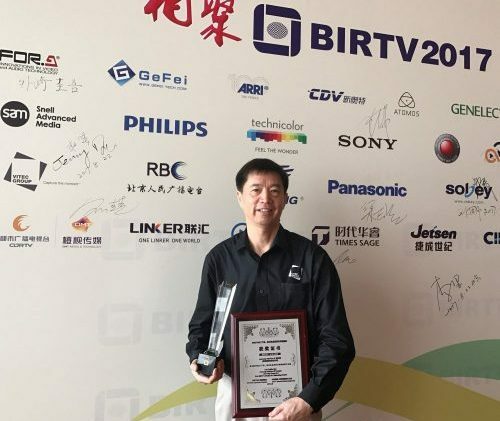 The BIRTV awards program is sponsored by China Central Television (CCTV), the national TV station of the People’s Republic of China, and executed by China Radio & TV Co. and the CCTV modern TV technology editorial office.